In today's environment, organizations are continuously introducing changes in response to internal and external stimuli. Some of these changes focus on processes, others on technologies and others on the structure of the organization. Regardless of the type, each of these changes impacts how individual employees do their jobs. The success of the change depends on the success of change management at encouraging individuals to embrace, adopt and utilize a required change. The Prosci change management methodology provides change management practitioners with the processes and tools to build customized, targeted and research-based change management strategies and plans to drive project results and outcomes. The unique integration of individual change management and organizational change management combines a results-oriented model for supporting a single individual through change with a process for practitioners built on decades of research. Individual change management is an understanding of how one person makes a change successfully. Whether at home, in the community or at work, individuals move through the change process in a predictable and expected path. Individual change management provides a framework for enabling one person to make a transition. What are the personal motivators and organizational drivers that would cause me to support the change? What knowledge, skills and behaviors are required during and after the change is implemented? How do I demonstrate the ability to do my job the new way? What barriers may inhibit me making the change? What will make the change stick? What are the rewards, recognition, incentives and consequences? 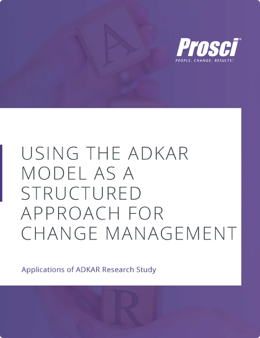 ADKAR is an individual model, so it describes the change process from the perspective of one impacted employee whose job is being changed as a result of a project or initiative. Whether it is a new process, a new technology, a new job role or a new behavior, a person makes the change successfully when they have awareness, desire, knowledge, ability and reinforcement. If the change impacts 1,000 people, then the change will only happen when all 1,000 people have awareness, desire, knowledge, ability and reinforcement. An individual change management model is crucial for effective change management because of the reality that change must happen one individual at a time. Each impacted employee must move from their own current state to their own future state. Organizational change management describes the steps, activities and tools a project team or change management resource can follow to enable the required individual changes. The Prosci 3-Phase Process presents a research-based approach for creating customized change management strategy and plans. Whereas the individual change management model focuses on how a single person makes a successful change, the organizational change management process focuses on the activities taken by a team to enable and encourage those individual changes. The individual change management model provides the outcome-orientation to change management. The Prosci ADKAR Model describes what you are trying to achieve when you work to manage the people side of a project or initiative. The organizational change management process provides the activity-orientation and lays out the actions a practitioner must complete for a project or initiative. The Prosci 3-Phase Process describes what you will do to encourage those individual transitions required by your project. Managing change without both perspectives is ineffective. Without an individual change management model, you cannot focus on the project outcomes. Instead, you become focused on your work (such as sending a newsletter) instead of what you are trying to achieve (such as sharing why the change is necessary). But without an organizational change management process, changes become unmanageable when they impact dozens or hundreds or thousands of employees. The organizational change management framework guides actual work in a manageable and repeatable way. What coaching do we need? How will we manage resistance? Successful change management results from integrating an outcome-oriented individual change management approach and an activity-oriented organizational change management approach. By aligning what we are trying to achieve with what we are doing, the Prosci change management methodology provides the structure and tools necessary to drive project results and outcomes by managing the people side of change. For some practitioners, this integrated approach requires a reorientation of thinking, away from the work being done toward the desired outcome of that work. But in the end, since the individual is truly the unit of change, successful change management must leverage an individual change management model and an organizational change management approach.